A 43-year-old man who was arrested after he reportedly ran naked from a home in Compton where he is suspected of fatally shooting his stepfather and a teenage girl and wounding a woman was being held Monday in lieu of $2 million bail. Jamie Williams has been booked on suspicion of murder, according to the Los Angeles County Sheriff's Department. The shooting was reported about 6 p.m. Friday in the 600 block of West Palmer Street, Detective Tony Moore said. When deputies arrived, they found a man and girl both suffering from gunshot wounds. Both victims were pronounced dead at the scene by paramedics, Moore said. 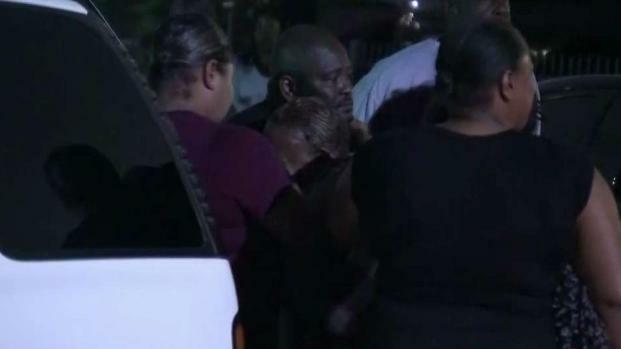 A naked gunman opens fire on family members killed two people, one of them a teenage girl. Robert Kovacik reports for NBC4 News at 11 p.m. on Sept. 28, 2018. The man was identified as Eddie Talley Jr., 65, and the girl as Brittany Malone, 13, according to Lt. David Smith of the Los Angeles County coroner's office. The wounded woman had been shot in the upper torso, officials said. She was taken to a hospital, where she remains in unknown condition. Talley was the suspect's stepfather. He and the woman were married and the teenage girl was the woman's daughter, according to the sheriff's department. "My sister was shot twice," Taylor Murrell, the brother of the wounded woman, told reporters at the scene. "My niece is dead and (my sister's) husband is dead. (My sister's) husband's son shot them all." Sheriff's Lt. Joe Mendoza told reporters that witnesses saw Williams "running out of the house naked." A possible motive for the shooting has not been determined, according to the sheriff's department.